Known As "America's Most Beautiful Theme Park"
Idlewild Park is nestled in the forest of the Allegheny Mountains, in a small community named, Ligonier, PA. Here is your chance to experience old fashioned Pennsylvania Amusement Park charm, with old fashioned entertainment,and best of all, old fashioned prices! Right across the road is an extension of Idlewild Park called Storybook Forest it's a magical storybook village for all ages to enjoy. Idlewild Park is located about 50 miles east of Pittsburgh. 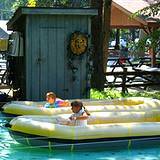 Idlewild is actually a sister park to Kennywood Park and Sandcastle Waterpark, it all began as a picnic park in 1878. Even though Idlewild Park continued to improve as ownership changed hands over the years, it wasn't until 1983 when Kennywood Park Corporation took ownership that the park really became a theme park. Idlewild is one of the few theme parks in the United States that a family can experience old fashioned atmosphere, entertainment and prices. In 1989 Idlewild Park expanded acroos the Loyalhanna Creek, and allowed the addition of Mr. Rodgers Neighborhood of Make Believe. They also installed the Neighborhood Trolly. From the moment you leave the trolley station your world turns into the imaginative world of Fred Rodgers. While touring through the castle the trolley will stop at each window for an appearance and conversation with King Friday, Queen Sarah Saturday, Danial Stripped Tiger, and various puppet characters that children from many generations have grown to trust and love. 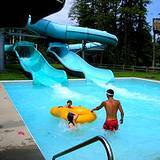 Idlewild Park is a Pennsylvania Amusement Park full of magic, surprises, and non-stop adventure. The seasonal events are endless at Idlewild Park. 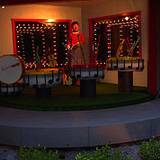 You can enjoy such events as Christmas In July, Old Fashioned Days, Highland Games Scottish Festival, and Hallowboo in October. 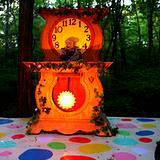 There is always fun and entertainment at The Hillside Theater Stage, The Hootin' Hollar Area, and The Storybook Forest Puppet Theater. You can see musical shows from the fifties, or Country Music shows that will keep you smiling throughout your day. Jumpin Jungle will get your family climbing and jumping. Take a stroll across the Swinging Bridge to the Tarzan Slide and Tube Slide. Climb the sturdy rope net to the Three Story Tree House. Take a rest while you feel secure allowing your children to play in the Bubbling Spring Ball Pit. All this with tons of Amusement Park Rides for teens, adults, and even Racoon Lagoon for children too young to ride the other rides. This Pennsylvania Amusement Park brags that it is actually listed as one of the Largest Kiddie Lands in the United States! One of the most unique Pennsylvania Amusement Park Attractions I have ever seen is Confusion Hill. Although, the name is as strange as the attraction. Confusion Hill isn't a hill at all, it's a small house. I'd say confusion is putting it mildly. If I would be in charge of naming this attraction I'd call it something like "The Little House Of Big Illusions." From the moment you start climbing the slanted steps your brain starts playing tricks on you. Walking along the cat-walk to see the different illusions is a feat in itself. Many people have to stop and find something to hold on to. I found myself dizzy and very unsure of every step I took. Even though there was nothing moving or shaking. Your brain will tell you what your eyes are seeing isn't possible. 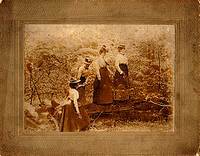 For instance, you'll see a lady pouring a picture of water into a trough but the water will flow uphill. I don't know about you, but I love illusions. Confusion Hill not only shows you illusions but forces you to interact with them. So expect the unexpected and whatever you do, don't pass up the opportunity to visit this unique Pennsylvania Amusement Park Attraction. And if what you have already read isn't enough to convince you to visit this Pennsylvania Amusement Park. I saved the best for last, Idlewild Park has even more attractions! 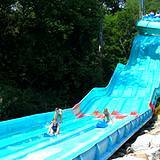 Soak Zone provides 14 wet and wild water slides. Along with Hydro Racers, Pipeline Plunge, and the huge Tipping Bucket. Even though the park is surrounded by forest and huge trees for shade, the Soak Zone is still a refreshing way to enjoy your summer in the Allegheny Mountains. Last but not least is my favorite attraction at Idlewild Park, The Story Book Forest. You will literally step through the pages of your favorite classic story books. You will find it hard to believe an amazing Pennsylvania Amusement Park like Idlewild Park is actually tucked away among the forest of the Allegheny Mountains. Far enough away from all the hustle of a big city. The location is actually half way between Altoona and Pittsburgh, PA. So you have the luxury of choosing a night in a big city or in the quiet of the Allegheny Mountains. The Allegheny Mountains are full of attractions. 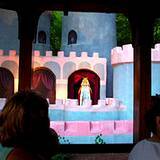 Visit other Pennsylvania Amusement Parks, all within a short drive. Take the time to tour around Pennsylvania Mountains of Attractions and you'll see what a great place PA is to bring your family. Click on the link below to visit Idlewild Parks Website to get more specific directions along with the current schedules and special coupons.